Delaware Art Museum: Al Held, " Rome 11"
I've been thinking about large painting installation since my last post and I realize it's not often you get the chance to work in that scale and scope. Size is the problem for the artist and collector. Who has studio space and help to work that large and who has a wall to display it? Generally, Museums have their own staff to handle the work and the few Art Handling Specialists who are lucky enough to be involved, are more often assistants in the process and not the lead in the project. For me, figuring out how, is the lucky part. Each step must be reasonable, cost effective and visually self explanatory with safety for the Art and crew the primary starting point. Viewers should be able to see, understand and make sense of the progression of the installation. Indeed, the installation is part of the "Art Show." A favorite Museum of mine is the Delaware Art Museum. 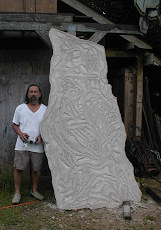 I've been fortunate to have worked there installing both large scale sculpture and paintings. In 2005, after renovation and expansion, the Museum re-opened. Among the Art works brought back from storage during Museum construction, the great Al Held painting:" Rome 11," was returned. I led the team which installed it. Difficulties included common building restrictions: smaller door openings, steps and low hallway ceilings. The main challenge was the actual wall where it would be hung. Below the painting, a stairwell to a lower floor was in the way, with a fixed stair rail in between the floor and wall. Floor load capacity and building configuration inhibited equipment that could be brought inside to rig the painting over steps. In general, I always prefer the crew to work naturally with minimum hardship, in that situation, ladders were not an option. Also, the building was in the last stages of finishing. Construction crews were still on-site, ideally, the install method would have a small footprint, use common tools, minimally intrude on others working and be able to set up and be taken down quickly. I decided to build a rolling deck based on two sections of scaffold. Cantilevered floor joists attached to the scaffold walk boards served as the base. We were able to assemble most of the deck, comfortably on the main floor and then roll the construction over the stair rail. 2" x 4" studs from edge of deck to steps below reinforced the deck for strength.